It's January 25th. Because I'm just this way, days of even sometimes the most mundane personal significance stick in my memory as days to be remembered, celebrated, or even mourned. January 25th is a day for a little of all of those because it was the projected due date for little Speck, my first baby that I lost to miscarriage around June 1st of 2007. Last year's post was decidedly anxious but not without hope and still coming across as quite mournful. While I will always feel a pang of mourning on this date for the loss of that little life, my sadness has even over the past year turned more to thankfulness and joy. Thankfulness and joy for what my God taught me during that time. As I spoke with my midwife today (who handled both of my pregnancies), she said that she feels like I've had a lot of hardship related to motherhood. I guess that is sort of true, but I really don't feel that way. I think that is because all of my experiences with Ezra, a rough labor, starving, inability to breastfeed, etc., have been experienced in the shadow, no, maybe the glow, of that first encounter with motherhood. I learned that the good that I perceive for myself is not always the same as the good that God has shaped for me to actually get. So, no matter what I get I know that (as my little 5 year old friend always says), "I get what I get, and I don't get upset." That doesn't mean that I've resorted to any sort of asceticism or a Buddhist view of not wanting so as not to be disappointed. Rather, I'm learning more all the time to want God's good more than the satisfaction of my own goals and dreams. So, it's not a lack of wanting, actually, but a very great and strong yearning to have only the very best; and only my Father in Heaven knows what that is. These experiences give me great hope. It's like the line in Amazing Grace: "Through many dangers, toils, and snares I have already come. 'Tis grace that brought me safe thus far, and grace will lead me home." A friend of mine shared with me that, really, each new challenge with your infant, then toddler, then young child, and so on is like a training wheel experience for each new thing down his or her and your road together. My greatest prayer is that this gift from God of the ability to take what he gives gratefully, painful though it may be, will be passed to and learned by Ezra and any other children I may have. I'm sure that I began learning it from my parents, especially my mother, even when I was very young. The other piece of all this is that I'm learning the firm gentleness of God's hand. How gentle and good of him to give me a happy, vibrant, laughing, distracted boy to wrangle as I walked in the communion line at church this morning while I wondered if Speck would have been like him. All the bitterness of her loss was eradicated by the syrupy sweet taste of knowing Ezra's wriggly loving body in my arms, trying to "kiss" me as I attempted to prevent my little cup of wine from spilling. Alright, here are just a few fun pictures. This has actually been quite a busy week for some reason. It involved our first nighttime date in 6 months (thanks Riberas! ), an exploding pyrex dish (yes, again! ), an accidental trip downtown on the express bus, "babysitting" Alaythia (actually just hanging out while her mom tried desperately to get some work done), and I don't even remember what else! The week began with the surprise realization that daddy didn't have to go to work. WOO HOO! Here we are "sleeping in" together. Ezzie has been enjoying his exersaucer! Thanks, Hainjes! They've really been our hook-up with this kid, as Ez sleeps in a formerly Hainje crib too. The big news at the moment is that Ezra only woke up one time last night! At 3 am! He ate, had a diaper change, and went right back down. He woke up a little at 6, but I just brought him in for our customary snuggling, and he slept until 7:30, the time at which I've been trying to wake him up! My next blessing on my mind is our new living room!!! New Couch, New TV Cabinet, and Ezra Safe! I have been thinking to myself about a hundred times a day, "I can't believe that my baby is so wonderful." He's just so much fun, and I can already see so many aspects of his personality emerging. He's observant, thoughtful, independent, ENERGETIC, and he has a great sense of humor. I still can't wrap my brain around that fact that my life is truly and forever changed. Just like getting married, but even more intense actually, a piece of my heart will now always be outside of my body and, in many, many ways, out of my control. I trust, though, that the same God who who controls that whole cosmos can take care of that little chunk of my heart. Ezra is a lovely, joyful child. I can't believe that God has been so good to me. Honestly, I was ready for whatever would come and would love him just the same. I think I was prepared, and even expected, to have a child with difficulties or problems, so I'm still shocked that he's so perfect (well, I know he's not perfect, but you know what I mean). He's definitely perfect for me. Sometimes I feel like my birth was just yesterday, but then it feels like it was a hundred years ago. Ezra is such a natural part of the flow of my life and days now. The sharp edge of the birth experience has now completely worn away, so that's nice. All of the sudden, all these things that felt so far off are upon me: solid food, baby proofing, bigger carseat, bigger stroller, exersaucers... the list goes on! I'm finally able to really savor the phase Ezzie is in right now because I'm beginning to see how fast it really does fly by. At the same time, I sometimes get exhausted just thinking about how much further there is to go... and he's only the first one! In the swing Grandma Debbie bought for his stay here. 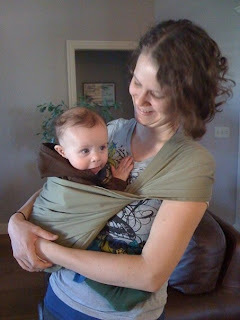 Trying our sling in a hip-carry position. LOVED it! Ezra liked it too- less restriction.